Stunning modern design and bold, high-end finishes make this approximately 11,020+ square feet of indoor-outdoor living the ultimate luxury experience. Located in desirable Atherton, this newly constructed three-story home features state-of-the-art and original design and walkability to Downtown Menlo Park and top-rated schools. A very rare combination. 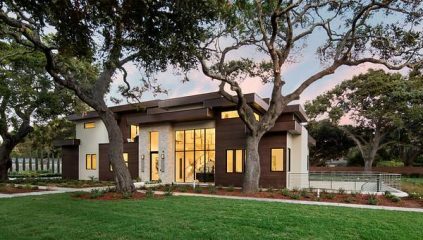 Set on a corner lot and with old growth redwoods and oaks, a crisp white privacy wall provides ultimate seclusion. The grand front entry welcomes you into a picturesque living room with a dramatic tiled fireplace. A sleek, chef’s kitchen in the great room features high-end appliances, custom cabinetry, a wine refrigerator and an oversized Caesarstone island. Walls of glass in the family room and living room open completely to a covered patio equipped with built-in speakers and recessed lighting, perfect for entertaining guests. Enjoy your private oasis by lounging poolside or in the nearby cabana with an outdoor kitchen. The luxurious master suite offers private access to the top-floor balcony. A spa-like master bath features a soaking tub, a substantial standing shower, his and hers water closets and an incredible, lavish walk-in closet. Three additional en-suite bedrooms, all with custom closets and private access to the balcony, and a laundry room complete the top floor. The lower level media room offers a wall-length bar with two built-in flatscreens and a separate entertainment area with walls of glass that opens to a spacious patio. The nearby theater room features tiered seating and surround sound system, and separate a glass-enclosed room creates a perfect space for a wine cellar or gym. Surrounded by top-rated Menlo Park schools, the prime location is just blocks away from shopping and dining in Downtown Menlo Park , Caltrain, and top-rated Menlo Park schools. Enjoy easy access to Stanford University, Stanford Shopping Center and Highway 101. This 11,020 square foot home includes: • State-of-the-art, gourmet kitchen in flat black and grey custom cabinets that rise to the lofted ceilings. The light charcoal tile backsplash and pure white Caesarstone countertops create stark, clean modernity that places emphasis on an oversized island and open great room enclosed in glass doors that lead to the expansive backyard. • Built-in Miele coffee and espresso machine; Miele double oven and gas cooktop; two Miele dishwashers; a Subzero wine fridge; and Subzero refrigerator. • The oversized front door opens to an Escher-like staircase that leads to the upper and lower level and a crisp white living room with glass doors that retract inviting an indoor/outdoor experience. • Lutron lighting throughout • Master suite with balcony, suspended gas fireplace, and beautiful views of the backyard. Grand master bath with phenomenally large shower featuring multiple shower heads, separate vanities and water closets enclosed in frosted glass and tiled in marble. The expansive master closet with soft pewter stained wood custom shelves and built-ins finishes off the luxurious space. • Lower level entertainment suite features a wall-length bar with two built-in flatscreens, refrigerator, dishwasher, microwave and large island with steel sink for entertaining large gatherings or providing easy access to food and beverages when using the nearby theater room with tiered seating or the glass-enclosed room perfect for gym or wine storage. • Walls of glass on the lower level lead to an outdoor patio that connects the lower level entertainment area to the backyard via a spiral staircase. • Six large en-suite bedrooms (two on the main level and four upstairs) with custom closets, unique Porcelanosa tile work and wall hung vanities. Main level also features an office with built-in bookshelves and access to backyard. • The oversized backyard features a stunning swimming pool with space to lounge. The nearby cabana includes an outdoor barbecue, refrigerator and dishwasher. • Detached three-car garage • Additional amenities include: built-in sound system, Lutron lighting, security system with security cameras, and Nest-controlled AC and heating. • Walking distance to shopping and dining in Downtown Menlo Park and Caltrain. Close proximity to top-rated Menlo Park schools, Stanford University, Stanford Shopping Center, Highway 101 and local parks.